Home / Training Advice / Stop sucking. Start winning. Derby players are quite possibly the most self-defeating group of people I’ve ever come across. We play a sport which most of us have been practicing for less than 10 years – sometimes as few as one or two years. So we often lack the facility and ease of athletes have who have been playing their sport since they could walk. Everything feels new, complicated, foreign. We feel like we’re “new at this” for years, even though having been in a league for 3 or 4 years in many cases makes you a super-veteran. In derby we are pitted directly against others in a very physical and – for lack of a better word – intimate competition. It is easy to incorrectly measure our own skill and worth against that of our opponents based on a single jam, or a single play. This experience is heightened in competition with our own team- and league-mates who we scrimmage and drill against, because of course, they are our direct competition for a spot on the roster, or for the coveted league trophy. One bad jam, one jammer let through on the inside, one failed attempt at a booty-blocking drill, and many of us are quick to tell ourselves we’ll never be good enough to beat that skater. Ever. And it seems to get worse the higher the skill level, the higher the caliber of competition. I’ve seen competent, strong, skilled players implode into major crises of confidence the moment they make the all-star roster. They believe in their hearts that they’re the worst skater on the team, and that there’s no way they’ll ever catch up to the level they perceive their teammates to be at. It’s the time of year for making bold resolutions – so I challenge you. 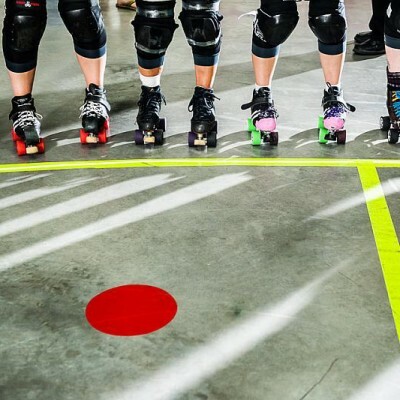 For the next EIGHT derby practices you attend, I want you to spend 60 seconds before practice begins – in the car on the way there, while you’re warming up, whatever – telling yourself what a strong, skilled, and smart athlete you are. Create a mantra for yourself that is easy to remember and repeat, and say it over and over to yourself inside your head. And believe it! An example from a basketball player friend is, “I am a strong and fluid athlete.” Then take the next 60 seconds to remind yourself of the particular skills you would like to (and will) display at that practice. 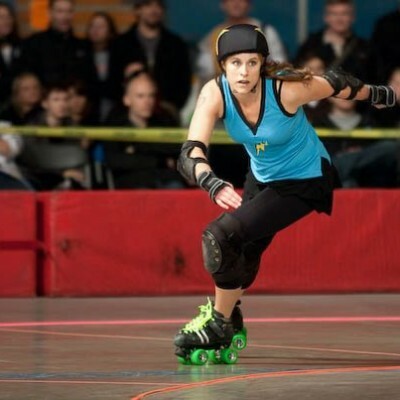 Something like “I skate low and stay with my teammates,” or “I am always aware of where both jammers are,” or “I see only holes, not blockers.” Repeat that one over and over to yourself too. 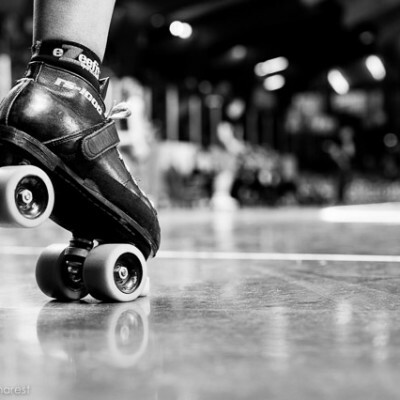 Make mental strength and self-confidence the center of your success in roller derby this year. Stop telling yourself what you can’t achieve, and start reminding yourself how capable, strong, agile, smart, and successful you are at this sport that you love. I dare you and challenge you to be a better athlete just by telling yourself that you are. Thanks to my favourite skate shop, Rollergirl.ca, for use of this photograph! Psssst: Want more articles like this, and free workout videos too? An interesting warmdown drill is a pace line where the last skater in the line works there way to the front of the line zig zagging through. As they pass the other skaters they give them a compliment. At the end everyone feels great. This is a more sensible version of ‘fake it until you make it’ – and so true that self belief is the hardest thing for most derby skaters. Getting the balance between working hard and stopping to acknowledge the improvement for a minute before analysing all the things that need work is tough. I’m definitely taking the time to ‘mantra’ my way to training – first practice back after break next Tuesday. 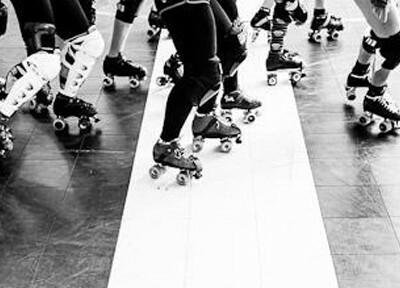 This post came with perfect timing, this past week I know I’ve been comparing myself too much to my teammates, most of whom have been skating since before I ever even heard of derby. Watching them, though, it’s hard not to think I’m the Worst Skater Ever. I’ll definitely be creating a mantra for myself. This post is timely indeed for me. I have a very demanding job and it’s not at all unusual for me to miss practice regularly due to my roster. I have been comparing myself to others on my team when I know that they often get to practice twice a week whereas I’m lucky to get there every second week! I nearly dropped out of the sport a few weeks ago purely because I “knew” I was the Worst.Skater.On.Earth!!! Thanks guys you’ve given me the lift I needed!